It’s a new year, a fresh start. Your start up has been chugging along, things are getting accomplished, but the pace is just not there. Or, maybe you have a looming expense, like app development or a big marketing launch that you see on the horizon this year. So, you’ve decided it’s now time for funding. Let’s make sure you’re ready. Business concept or operating business? Check. Go to market strategy & plan for funds? Check. Know how much you’re looking to raise? Check. Have an idea of where you’re going to start looking for investors? Check. Have a pitch deck that your proud of that truly tells your startup’s story? Well? If you don’t, this is your next stop on the road to funding-ville. But when considering putting together a pitch deck / investor deck, many founders often ask, what are my options? When considering putting together your logo you had options (DIY, an outsourcing design platform, a trusted designer, a branding and marketing powerhouse), and when you put together your website or designed your app you had options (DIY, a low budget offshore resource, a trusted local upstart, a high dollar high / value developer). So today I am going to shed some light on what your options are for getting your pitch deck created and some considerations when choosing which option works best for you. My goal with this article is to delve deeply into each of these options, the pros and cons of each, and give you some consistent criteria to compare them more easily. But before I go into each of these, I want to give you a quick idea of the rankings I’ll be using. To give you a better comparison across all of these options, I have scored them based on a few important criteria for today’s founders. Price, Time, Effectiveness, and Design Quality. First off, I know how important cost can be to bootstrapped businesses. The funds are limited and you want to keep a close eye on the purse strings so you don’t run out of runway before you get funded. So the first criteria I used to rank these options is “Price”. I am giving cost three ranking levels, Low Cost, Medium Cost, and High Cost. Low cost being anything under $500, Medium cost being $500-$1,500, and High cost being $1,500-5,000+. Another very limited resource in the life of the founder is time. You have only a finite amount of it to spend doing all of the activities that you need to run your business, make plans, manage team members, network with investors, sleep (don’t forget about that last one!). So we’re ranking each of these options on the amount of Founders Time it takes to get the pitch deck completed. The ranking levels begin with a Low amount of time, medium amount of time, and a large amount of time. A low amount of time being 2-3 hours or less ranging on up to a high amount of time 60-80 hours or more. This is the most common way the founders, especially first-time founders, attempt to put together their pitch deck. The use case often looks like this: 1) Apply to pitch at a pitch competition, 2) Get accepted, get excited and celebrate your inevitable success, 3) Wait until the night before to google “what is a pitch deck?” and try to put one together yourself before the competition. For competitions and when seeking investment, many founders are thinking about opting for a DIY approach to their pitch deck creation. This is the most time consuming option, but also the cheapest. You can accomplish it for free, or with only the minimal cost of stock photos. But keep in mind that researching how to put together a pitch deck, iterating on your content, and learning to use the tools and struggling to design a professional pitch deck on your own can take upwards of 40 to 80+ hours to complete. There is a lot of starting from scratch here, and a lot that depends on you and your skill set. The effectiveness and design quality are unclear becuase they are very dependent on these factors. If you are a professional designer, or have a keen design eye and skillsets in design tools, you may be more well equipped to handle the task of putting together you pitch deck. On the otherhand, many founders struggle with getting up to the 30,000 foot view on their company and telling their story the way an investor would find enticing. So if you are a first time founder and/or a technical founder, working with an expert may be a better option. An attractive option for the founder DIY-ing their own pitch deck is the pitch deck template. There are many of these floating around on the web. In fact, we have a whole blog post on pitch deck templates. We even have a free template you can download there. But, the problem with using a template is that while they are free, they do not provide enough direction to ensure your deck is effective. An often stale set of common slides will be an OK place to start, but they will not help you shine on their own. Along the same lines, pitch deck templates utilize pre-designed slide options–some more tailored than others–that you can “input” your content into and customize. Unfortunately many of these are so overused, that it can be obvious when a template was used. Plus, these designs are made to fit many brand any design styles, and will not help visually tell your brand. The price for templates is free or low cost, but the time to put your pitch deck together is still very high. And again, the effectiveness of your deck and the design quality are unclear and very dependent on your personal abilities and knowledge base. Many founders realize that their own design capabilities are lacking, and choose to utilize a contract designer to design their pitch deck. The most affordable way to get your pitch deck designed is by using a contract designer. These are often found on large freelancing platforms or by asking collegues who they’ve worked for in the past. These designers generally have a wide breadth of collateral they can/will design including logos, marketing collateral, and other general design needs. The skill level and cost of general designers varies wildly, but on average their price points for a pitch deck-size project is medium, or $500-$1500. More often than not the skill level and experience of the designer coorrelates to the price point charged. Some designers will charge hourly, while others a flat project rate. You may be working with a local designer, or one from half way across the world. For the most part generalist designers will improve the quality of the design of your deck, it will be more visually appealing. One thing that general designers lack is knowledge of and experience with pitch decks specifically, business acumen, understanding of the investor perspective, and sometimes lack of understanding of powrpoint or other slide deck mediums. This means that not only will you likely get little to know assistance with your story, the messaging, but also the deck may be more suited to a printed format rather than amore flexible, presentable slide-based one. If you have a strong knowledge of what your pitch should say, the content included, the flow of the deck, and feel you can closely direct your designed to get the results you are looking for, this can be an affordable option. For this reason I’ve ranked their effectiveness unclear (it depends heaviliy on you) as well as the time and a medium duration of time (you’ll more than likely be spending significant time putting together the skeleton deck that you want redesigned prior to working with your designer as well as design revisions to get the look-feel right). A new model that I have seen popping up more an more is the pay-by-the-slide model. It can be another affordable design option for the founder with a really solid grip on the content, story and flow of his/her pitch deck. Here again you’ll need to spend a significant amount of time putting together a truely stellar outline or skeleton pitch dack, along with a clear idea of how you want it to look once designed. The way the pay-by-the-slide companies work, is that you submit a certain number of pre-written slides with the copy you wish those slides to contain. (copy is industry slang for the words you want on the slide). You may or may not be given the ability to provide overall design direction along with your brand logos, colors, and style guides. The company will then outsource or push the slides tobe designed out to on-staff designers (often based in lowerwage countries around the world) to complete the work. You can a set price per slide, and sometimes an additional fee for slide edits. The designers often use a bank of pre-made slide templates that they choose from and tailore your slide to fit your brand colors and content. The deck is then returned to you for your review. Some companies also charge for additional revisions. Like general designers, the pay-by-slide designers may or may not know pitch decks specifically, the investor audience, etc. Without a detailed discovery session discussing your project, the product you receive will likely be visually appeally, but may lack a uniqueness and flow that will help your company shine. This option is sort of a hybrid of a template and a designer. The price is in the medium range and depends a lot on how many slides you need completed. Your time is somewhat significant as you will need to prepare the content for the pitch on your own first. The effectiveness of the deck depends a lot on your experience and quality content, and the design quality will be good, but likely not stellar as templates are often used to keep the per slide costs low. Now we get into some of the more costly, but often higher value options for having your pitch deck created. There are many large marketing agencies that provide full-service design assitance for any and all of your design needs. Many lock clients into a long-term or monthly project that covers a certain number of design hours per month. These guys have impressive design chops, and are often very good at what they do. They focus primarily on large branding and logo design projects, website development, and marketing collateral. Oftentimes they add-on pitch deck design services at the request of clients who are looking for help. The pitch deck that a marketing & branding design house will provide will be really well designed, it will be professional and highly visually appealing. Accordingly, the price for those services will be high. You would be hard pressed to find an agency like this to work with you on a pitch deck for less than $2000, possibly over $5000 per project. On the otherhand, these designers do not have specific experience with pitch decks, and may have only completed a few decks in the past as add-ons for other clients. They will not be able to assist with any of the content creation, or ensure that your messaging fits an investor audience. The effectiveness of the deck is therefore up to you, and the amount of time you spend put into putting it together. An interesting side note: Because these designers are more comfortable designing in other design tools (like adobe illistrator and photoshop) unless you specifically ask for a powerpoint file, they may only provide other less slide-focused files or worse un-editable files. This can be dangerous when with the ups and downs of your fund raising round, you have small changes to your financials or a small wording change or slide order change you wish to make. Here, you’ll be stuck hiring the original designer for costly edits over time. A very new service I have seen more and more of over the last few years is the pitch content coach / contractor. This individual is often a previous startup founder, a startup mentor, or otherwise experienced individual who is offering their assistance to startups seeking funding. I think some of these people come out of mentors who were tired of giving thir recommendations and feedback on decks to founders for free, and are seeking to monetize their knowledge base. Some provide feedback and coaching sessions, and others actually sit down and help put together the content for your pitch for you. All of them focus on the story, the message, what kinds of information your potential investor group wants to hear. They can help founders to get up at a 30,000 foot view on their business and be able to translate that into a skeleton deck. Alsmost all, leave you with either just their notes or at most a skeleton deck. That is, the copy, the words, the flow, and the order of the slides. Not the design. They do not do any deck design work. These guys just simply aren’t designers. You’ll be on your own either to design your slides yourslef, or to find another design to work with to make the deck visually appealing. These coaches are usually somewhat expensive, but your deck will likely be very effective at conveying what it needs to convey. The design quality here is unclear, because you’ll need to find an alternative way to solve that piece of the puzzle. Because of this, your time needed to work with them is still somewhat significant because you’ll need to handle the rest of the pitch deck completion after working with the content-focused contractor. If you have an in-house design team or a designer you are really comfortable with, doing a project each with the pitch content coach / contractor and that design resource may be a good fit. That said, two separate projects could be one of the leaset economical options in terms of overall price and they time you spend. One of the best options for getting your pitch deck completed is using a pitch deck design specialist. A pitch deck design specialist is highy experienced in putting together pitch decks for clients seeking funding. These individuals and companies know the investing space, they deeply understand business, business models, go to market strategies and ways to define your market size. Some offer add-on services with financial and/or research help, or pitch coaching for live presentations. But primarily, they specialize in creating stellar professional and visually appealing pitch decks. The price for working with pitch deck design specialist varies a little, usualy ranging from $2000-3000. Some pitch experts may charge higher price points. Pitch decks created by pitch experts are highly effective, and good pitch deck designers will walk you through the content creation of your pitch. They will ensure the message is clear, and that your telling a compelling story to the potential investor. In addition, the design quality will also be impeccable (expecially when working with highly experienced teams). They know good design and create beautiful graphically focused decks that are professional and usable. A good pitch deck designer also has clear process by which they work with you to ensure that you work closely on the project, but at the same time they do not use too much of your time. This is one of the least time-intensive options because these guys know pitching and design and can execute on both with minimal input. When deciding on a pitch deck design specialist, be sure to work with a designer or company that will be providing you your editable files. If not, you will be beholden to them for any edits or changes to the deckover time. They should provide your deck in an editable and usable form, like powerpoint. For many entreprenuers, this options is the most bang for your buck. While not cheap, the services are highly valuable; the end product is highly usable and effective while being professional and visually stunning, plus your time speant on the project is less than any other option. So with all of these options to complete your startup’s investor presentation, how do you choose the solution that works best for your needs? It can feel hard to make a decision, especially with such nuanced differences between these options. I recommend that you first consider the importance of and relative importance of the criteria to you and your business. Price: Do you have the funds to acquire the services you need? How much funds can you sivert to this cause? What value would a stellar pitch deck provide to you? Will you be able to reuse the documents for other valuable tasks? With a great pitch deck, can you get funding faster? How much does one less month of burned runway save? Time: How much time do you have? Are you busy working on other key functions of your business? How much is your time worth? Are you already confident with your knowledge of pitch decks and capabilities in design? If not, factor in 2-3X learning curve time. Effectiveness: This one is kind of a no-brainer. How important is an effective deck to your business? What are you using your pitch deck for? Will it be helping you to successfully acquire thousands? millions? Design Quality: Think about the last advertisement you saw, chances are it was well designed. We live in a world where our eyes are trained to pay attention to clean and professional work, and avoid or think less of sloppy, messy collateral. Will you be showing this deck to investors? Large audiences? What do you want them to think of your company? Investors see startup pitches day in and day out, how valuable would it be to stand out, and to get the coveted “in-person meeting” with more potential investors? How would that effect your speed to funding and your valuation? Consider all of these factors and you should have a good idea of the solution that works best for your needs.  If you land on working with a pitch deck design specialist, consider working with us here at Pitch Deck Fire. We have worked with hundreds of founders in all different industry across the world to better tell their story with professionally designed pitch decks. Our clients have won pitch competitions, gained key partners and clients, and have raised millions. Find out more at Pitchdeckfire.com/get-started. Let’s hop on an initial call and find a solution that works well for your needs. Best of luck with your pitch deck creation and happy pitching!